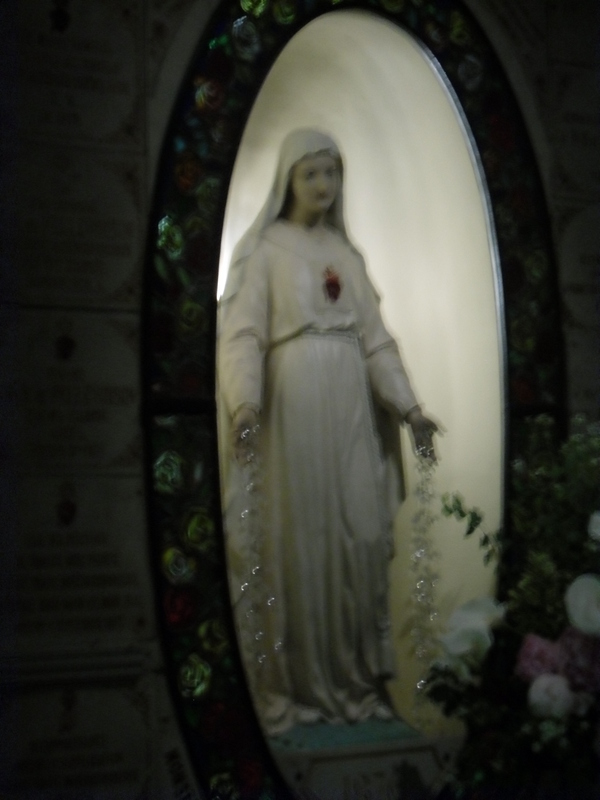 Reflections on my Pilgrimage to Pellevoisin… on the Memorial of the Immaculate Heart of Mary. A soldier going into combat knows that he must choose his supplies carefully, for he can only use what he can carry. Armour is heavy, and whatever is chosen must be carried through the day of battle. But few soldiers would leave aside from their kit a photograph or token of their wife, to give them strength in their darkest hour. In my undergraduate days, a member of the student rosary group once commented on how a scapular closed a gap which would otherwise exist in the “Armour of God” – for the list given in Ephesians 6:10-17 contains no item to protect one’s back. Since a scapular is composed of panels over one’s back as well as one’s heart, my friend saw his Brown Scapular as a sign of Our Lady standing behind him to guard him from unexpected attacks. In the case of the Scapular of Pellevoisin, Our Lady did not prescribe a design for the rear panel, but said “I reserve it for myself”; Estelle should make a suggestion and the church should decide. Estelle proposed an image of Mary as she had appeared at Pellevoisin, encircled by roses and with the Lord’s graces flowing from her hands. The Church authorities agreed, but decided that a title should be printed there: MATER MISERICORDIAE – Mother of Mercy. 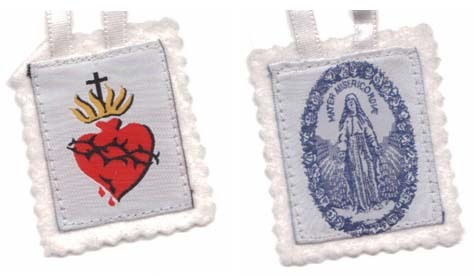 To wear the Scapular of the Sacred Heart, then, results in an image of the Mother of Mercy guarding one’s rear. It is part of the official teaching of the Church that Mary is indeed a channel of God’s grace to us, a mediatrix of grace. The image of Mary as a channel of God’s grace is not new. When she appeared in 1830 to St Catherine Labouré to reveal the ‘Miraculous Medal’ there were similar rays of grace flowing from her hands – and a sad acknowledgment that more graces would flow if only we remembered to ask for them. For this reason, we are invited to pray the prayer inscribed on the medal – O Mary, conceived without sin, pray for us who have recourse to thee. The Belgian mystic, Berthe Petit, taught us to invoke the Heart of Mary as the Sorrowful and Immaculate Heart: O Sorrowful and Immaculate Heart of Mary, pray for us who have recourse to thee. Mary’s Heart is Immaculate because of God’s gift, but also sorrowful because of Mary’s free choice to unite herself to the suffering work of her Son. Our Lady said to Estelle Faguette that the Heart of Jesus “has so much love for mine, that He cannot refuse my requests. Through me He will move the most obdurate. I am come in particular for the conversion of sinners.” The same message of converting sinners was Mary’s revelation to Sr Justine Bisqueyburu in 1840, through the promotion of a Green Scapular with the prayer: Immaculate Heart of Mary, pray for us now and at the hour of our death. Through her messengers, the Mother of God has offered many gifts to her children. 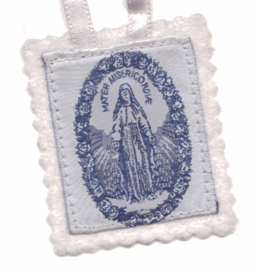 A promise of great graces to those who wear a ‘Miraculous Medal’ around their necks; a gift of conversion of sinners through the Green Scapular. The Scapular of the Sacred Heart revealed at Pellevoisin is attached to no special promise, other than the assurance those who wear it in the right spirit are performing an act of devotion which cannot be surpassed. Indeed, there is no shortage of spiritual weapons on offer from the treasury of the Mother of God. A soldier going into combat knows that he must choose his supplies carefully, for he can only use what he can carry. Our Lady told Estelle Faguette, on showing her the image of the Sacred Heart, that “The treasures of my Son are open; let them pray.” We might hear an echo of the message to St Catherine Labouré that we should pray for the graces we need; but we might also pray for wisdom in making a choice of which devotions to pursue. I have devoted these pages to sharing the message of Pellevoisin not because it teaches a devotion which everyone must embrace, but because it is another gift on offer from the Mother of God, which some in the Church will feel called to take up. Others will fight with other spiritual weapons, and this too is a blessing; for together, we make up the One Body of Christ. 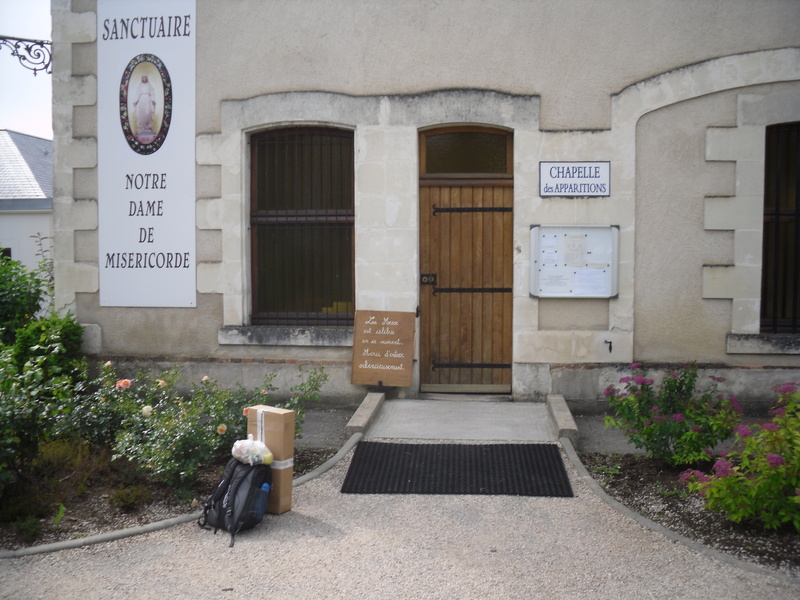 Reflections on my Pilgrimage to Pellevoisin… on the Solemnity of the Sacred Heart of Jesus. Pellevoisin offers us an unusual specimen of Christian imagery: the Heart of Jesus on the breast of Mary. To find the Blessed Mother carrying her child – in her arms or in her womb – is common enough; and the image of Mary showing her own heart, suffering in sympathy with her Son’s passion, is familiar through the imagery of Fatima, Beauraing and the Green Scapular. But here, the Mother bears the Heart of her Son in exactly the same way in which she asks us to bear it – on a simple piece of cloth over her breast. Here, then, we see Mary as a simple disciple, one who – like us – chooses to imitate the love shown by Jesus Christ and make it her own. When Jesus spoke to St Margaret Mary in Paray-le-Monial in the seventeenth century, he made numerous promises, including one of blessings to any family or community which honoured Him by reverently displaying an image of His Sacred Heart. It is from Paray-le-Monial that we receive the establishment of today, the Friday in the week following Corpus Christi, as the special day which honours the Sacred Heart of Jesus. Our Lord asked for two special practices today. One – in an age where Catholics only rarely received communion because of an exaggerated respect for the holiness of the Blessed Sacrament – was to receive communion on this day. 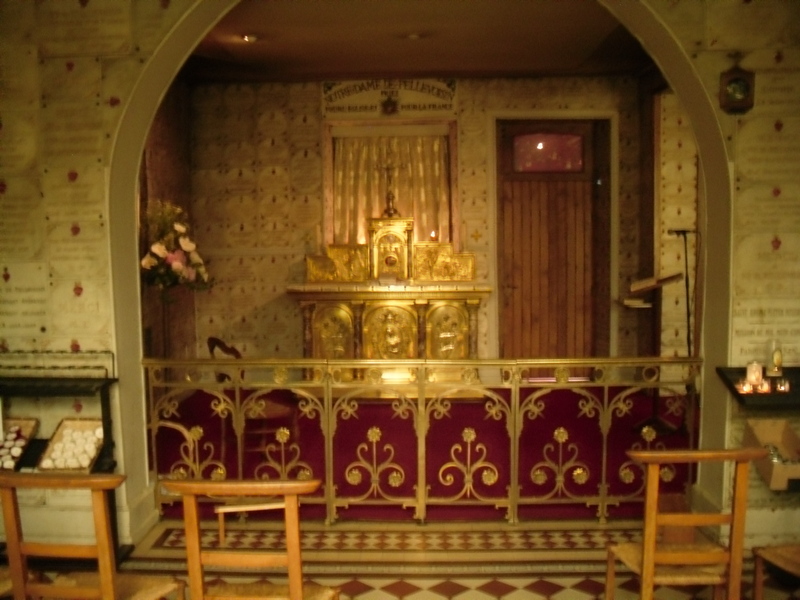 The other was to make an act of reparation for indignities committed against the exposed Blessed Sacrament: a theme which is also found at Pellevoisin. If you are reading this too late to make such an act on the day devoted to the Sacred Heart itself, then recall that through St Margaret Mary, the Lord also invites us to make such an act of reparation on any Thursday evening, and to make a special effort to receive communion on the first Friday of every month. Above all, remember that the greatest act of reparation is to take stock of your own attitude to the Blessed Sacrament, and to choose to amend anything which falls short of what your King, Saviour and Friend deserves. Reflections on my Pilgrimage to Pellevoisin… on the day when Cardiff Pilgrims begin their journey to the International Eucharistic Congress with a 6 a.m. service of prayer at Llantarnam Abbey. You deprived yourself of a visit from me on the 15th of August; you were not sufficiently calm. You have indeed the French character, wishing to know all without learning anything, and to understand everything before knowing it. I would have come to you yesterday, too; again you deprived yourself of it. I was waiting for this act of submission and obedience from you. What afflicts me most is the want of respect shown by some people to my Divine Son in the Holy Communion and the attitude taken for prayer, when, at the same time the mind continues occupied with other things. I say this for people who pretend to be pious. Choosing to pray requires an act of will; choosing to remain focussed in time notionally given to prayer requires considerable effort. Estelle missed out on an earlier apparition because she had not chosen to give time to prayer, or to allow sufficient time and space for her prayer to be recollected. Most of us have probably had the experience of being put “on hold” by a friend whose mobile phone has rung in the middle of a conversation; perhaps we measure the importance of our relationship with the phone’s owner by the brevity with which the call is dealt. How do we deal with our own incoming calls? How do we create time and space for our conversation with God in a way which gives respect to the King of Kings? I am not a “morning person”, and throughout seminary and for the first five years of my priesthood, I made it my rule to give the “first available” time in the working day to God. Often that time slipped because of the “must do” and “just do” jobs. Once the day gets going and phone calls or visitors arrive, there are things I must do. And in odd fragments of time there are things I’ll “just do” before I pray – but the 5-minute job easily ends up taking 20, and too often my prayer time had slipped to the end of the day; it got done (usually) but when tired, distractions were common and the effort needed seemed so much greater. At the start of Lent this year I decided I was going to have to bow to the inevitable: the only way to put God first was to literally put God first, rising early enough to give God an hour of prayer before the phone was likely to start ringing. God will not be outdone in generosity, and I have experienced the months since Lent as months of considerable blessing. So why not give it a go – try praying first? If you are battling with distractions, fear not: help is at hand. Reflections on my Pilgrimage to Pellevoisin… for the Solemnity of the Body and Blood of Christ (Corpus Christi). All sin offends God, by its very nature. But here Our Lady was specifically speaking of sins against the Blessed Sacrament. What does this mean for our own day and age? Christians outside the Catholic and Orthodox traditions sin by failing to recognise that Jesus wishes to feed us with his true body and blood by the hand of a priest. Today it is perhaps not well understood among Catholics that not all services of Holy Communion are of equal spiritual value; it is worth restating that the power to make present the Body and Blood of Christ is only given to a priest through the laying on of hands by a bishop who can trace his line of ordination directly back to the Apostles. We do not deny that God pours out blessings on other Christian communities who celebrate Holy Communion following their own tradition; but we cannot affirm that their bread and wine truly becomes the Body and Blood of Christ, and for this reason Catholics cannot receive Holy Communion with integrity at Protestant services. if they don’t receive Holy Communion in a reverent manner. The teaching of the Catholic Church is that a communicant may receive Holy Communion in the hand or on the tongue. It is always permitted to receive on the tongue, and communion in the hand is authorised at a national level, not by individual priests. I believe that reverence is fundamentally an attitude of heart. It is possible to receive Holy Communion reverently in the hand. For years, before my ordination as priest, I did so myself – I would take the Host, step to one side, make a short prayer in my heart of trust and recognition of the Lord who deigned to dwell in my hand at that moment, and then consume the host. I also believe it is possible to receive Holy Communion on the tongue irreverently – through a sinful lifestyle, immodest dress, or by an ostentatious display of piety in receiving communion. I am aware that there are currents of opinion which say Our Lord or Our Lady have told certain visionaries that Jesus does not want communion in the hand; or that the official permission was only granted because of pressure from certain lobbies (possibly Masonic) within the Church; or that Mother Teresa of Calcutta, now Blessed, is alleged to have disapproved of the practice. But Our Lord entrusted Peter with authority over his Church, and it cannot be the case that anything which the Successor of Peter has formally permitted could be intrinsically irreverent. I applaud those Catholics who receive on the tongue because they believe it is “more reverent”. I also applaud those who exercise their choice, in nations where it is permitted, to receive in their hand in order to have a moment of reverent recollection free from the distractions of the movement of the communion queue. On this Solemnity which commemorates the Lord’s gift of His Body and Blood to His Church I ask you, gentle reader, to examine your conscience. Do you truly believe that Jesus is present, yet hidden, in the most profound way possible in the Blessed Sacrament? And if you do, is there anything lacking in the way you pay Him respect whenever you visit His House? If you have sinned, place your trust in His Mercy, and make your peace with Him through His priest at the earliest opportunity. And in this way you too will help to repair outrages against the Most Holy Sacrament of the Altar. 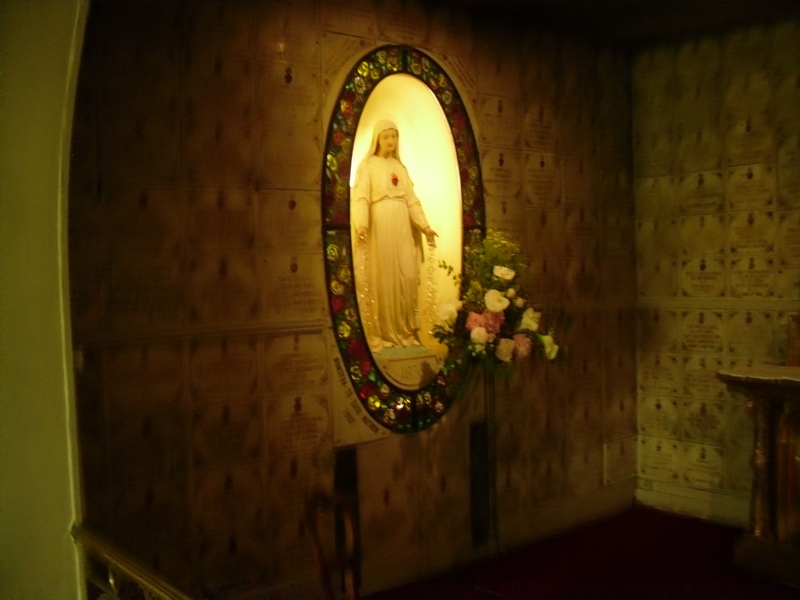 Perhaps the most memorable aspect of the message of Pellevoisin – and certainly the one which stuck in my mind when I first read the story of this shrine – was the invitation to wear a Scapular of the Sacred Heart because “nothing is more agreeable” to the Mother of God than to see this livery on each of her children. I am a very practical person and I like simple instructions: “Do this. Don’t do that.” The Lord’s command to “Do this in memory of me” led to my becoming a Catholic in 1990. A request from Our Lady to “wear this, for nothing is more pleasing to me” was therefore irresistable. Yet these words must be taken for more than their face value. Christianity is not a religion in which we are saved by wearing talismans or amulets. In the light of what we read in the New Testament, can it possibly be true that “nothing pleases the Virgin Mary more” than believers wearing a patch of cloth on their breasts? 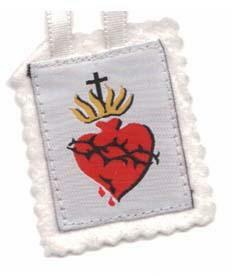 Any scapular represents an act of obedience; it is a sacramental making present the “yoke of Christ”. Many scapulars are associated with particular religious orders and are worn by their affiliate members; each religious order represents a particular path to holiness. 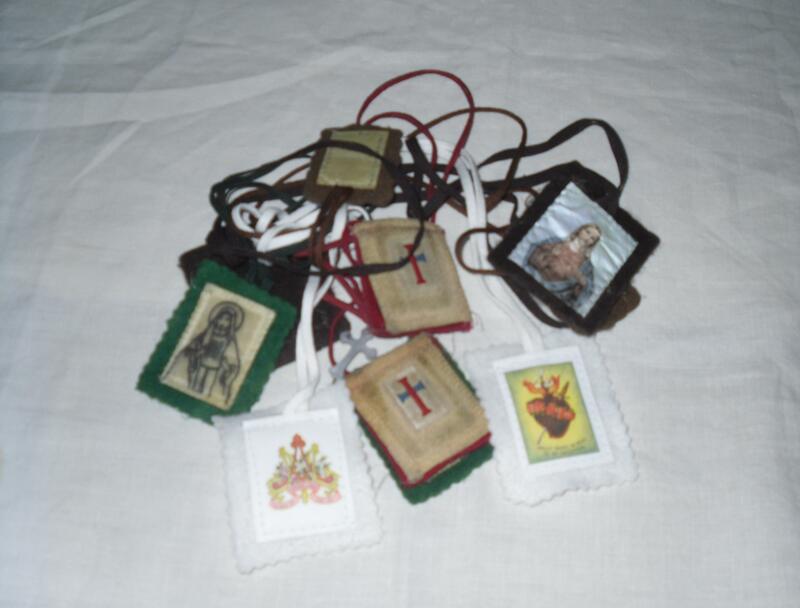 Each order has its own spirituality, being one of many such paths within the One Way, who is Jesus Christ; the scapular is a yoke to the rule of that order. Scapulars are not new in the history of the church, but the design of the one given at Pellevoisin is novel; and unlike the more ancient scapulars, for which boundaries between sure history and pious legends have become blurred, there is no doubt about its origin in a private revelation. When you wear more than one scapular, the cords soon become tangled. The same might be said for trying to embrace more than one kind of spirituality. If you try to wear more than one scapular, they quickly become tangled. In the same way, taking on too many devotions, a scattergun approach to spirituality, can lead to confusion. No particular scapular, no one devotion, no prayer ascribed to a private revelation, is ever necessary for a person to live a life pleasing to God; each one represents a simple invitation from heaven to which some Christians are called to respond. It is more important to choose to do a few things well than to attempt to embrace everything. Why, then, might a soul choose to take on the Scapular of Pellevoisin rather than any other yoke? Such a soul would be choosing to wear the image of the Heart of Jesus over their own heart, which surely represents the aspiration to love as Jesus loves. The Heart of Jesus sheds drops of blood, recalling the choice made by Christ in Gethsemane to accept the Father’s Will, no matter what sacrifice that might entail. The Heart is crowned with thorns, reminding us how Christ was mocked in the sight of jeering crowds. The Heart is surmounted by a Cross, the Cross which the Lord bore to Calvary with all His remaining strength. The Heart also blazes with love, represented by the fire which erupts from it to surround the base of the Cross. Those who wear such a scapular must choose to do the Father’s Will whatever the cost, accept mockery before an unbelieving world, and like all disciples, carry their Cross each day until they arrive at the glory of heaven. When Our Lady says “I love this devotion”, surely she means not only the act of wearing such an image over one’s breast, but the daily devotion involved in living out these values which it represents. These values embody a way of living out the Great Commandments to love God and neighbour; and this being the case, then indeed, Our Lady can truly say that nothing could be more pleasing to her. This week I made a brief pilgrimage to the shrine of Our Lady of Mercy at Pellevoisin, France. Since I will not be preaching in the parish for the next two weeks (there is a Pastoral Letter on 9/10 June and I am at the International Eucharistic Congress on 16/17 June) I will be offering you some reflections on my pilgrimage over the next two weeks instead. Pellevoisin: The place of the 1876 apparitions is now a chapel. The story of Pellevoisin is simple enough. In the year 1876, Our Lady appeared 15 times to a 32-year-old domestic servant, Estelle Faguette. In September 1875, Estelle was seriously ill; she made a written petition to the Mother of God, asking that her health be restored so that her parents, also ill, might not have to beg for food. By February 1876, Estelle’s condition seemed terminal, but on the consecutive nights of 14-18 February, Our Lady appeared to her, spoke with her about those personal faults which she needed to correct, and declared that Estelle would “publish the glory” of Mary. In the early hours of Saturday 19th February, Estelle found herself to be healed. In July, the Mother of God visited Estelle on three consecutive nights (Sat 1 – Mon 3) and confirmed her mission to make known Mary’s glory, to accomplish the conversion of sinners. (In the liturgical calendar then in force, the Visitation of Our Lady to St Elizabeth was celebrated on 2 July, and July 3 was the Feast of the Coronation of Our Lady of Lourdes.) Throughout all the visions so far, Estelle had noticed the presence of a plain square of white cloth on the Blessed Virgin’s breast. You know well that you are my daughter. I am all merciful, and mistress of my Son. What afflicts me most is the want of respect shown by some people to my Son in Holy Communion, and the attitude which they assume in prayer when the mind is occupied by other things. His Heart has so much love for mine, that He cannot refuse my requests. Through me He will move the most obdurate. I am come in particular for the conversion of sinners. I recommend calm, not only for thee but, for the Church and for France. I have chosen thee. I choose the little ones and the weak for my glory. Estelle was then commanded to go to her local bishop with a model of the Scapular which she had made, and to pass on these words from Our Lady: “Nothing will be more acceptable to me than to see this livery on each of my children, and that they all endeavour to repair the outrages received by my Divine Son in the Sacrament of His Love.” The Mother of God did not specify the design for the rear panel of the scapular, saying that the Church authorities should decide. Within a few days, the Archbishop of Bourges had received Estelle favourably and permitted copies of the scapular to be distributed; in 1892, Pope Leo XIII sent a candle to Pellevoisin as a tribute, and declared an indulgence for those who made a pilgrimage there. In 1922, Rome gave permission for Pellevoisin to keep a special votive Mass of Our Lady on 9 September each year. Estelle died on 23 August 1929; in 1983, after a theological and medical inquiry, her healing was declared to be of “miraculous character”.